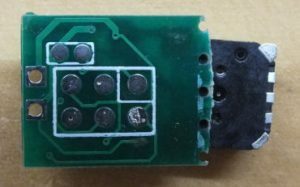 This is a low voltage alarm for 1s lipo batteries. It was designed to be light weight for DLGs (discuss launch gliders). The schematic is shown below. The schematic is quite simple – a microcontroller, a buzzer and voltage divider to measure the voltage. The microcontroller runs at a low clock frequency to reduce power use. It also spends most of its time sleeping, waking every 0.125 seconds to check the voltage, and beep if necessary. 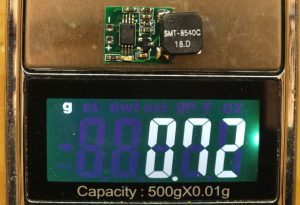 The microcontroller is an ATtiny45-20XU – this comes in an 8X package which is half the weight of the next lightest package. 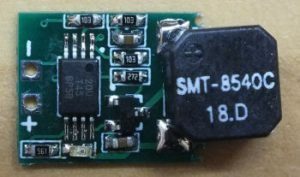 The divider divides the voltage in half; accuracy isn’t important – it only has to reduced the input voltage below the internal 2.56v reference. The “Low Voltage” value is set from Vcc, either the first time it is powered, or if the “configure” pin is bought low at start up. That way the cut off value can be programmed to any value, and the resistor divider doesn’t need to be accurate – we only use the value we sample from the ADC at configuration time. The LED flashes when in configuration mode, or when the alarm triggers. The buzzer is controlled using a PNP transistor. 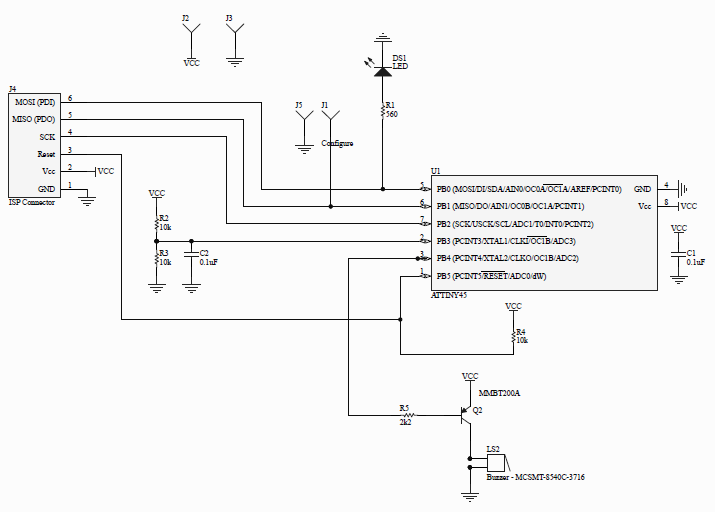 This is what was recommended in the buzzer datasheet. I don’t know why this is the case, but it definitely performs better. I tried about a dozen buzzers (see the spreadsheet in github) – the selected buzzer was the best combination of light weight, lower power draw, and loudness. The assembled board is shown below. Note that the board has been cut to reduce weight. On the bottom of the board are pads for the ISP, and 2 pads for configuration (short the pads as power is applied). The overall weight was 0.72 grams (0.43 grams is from the buzzer). I built this with plans to combine it with a Spektrum receiver, but I switched at the last minute to a FrSky G-RX6; this has telemetry which allows me to monitor the voltage in the transmitter.